Use the Communication tool to create announcements for individual courses or groups of courses. Open Communication from the Main Menu. Click New Announcement in the toolbar. The To: field is automatically populated with the current course(s). Open the To: field to see a dropdown of potential recipients and click the box next to desired recipients. 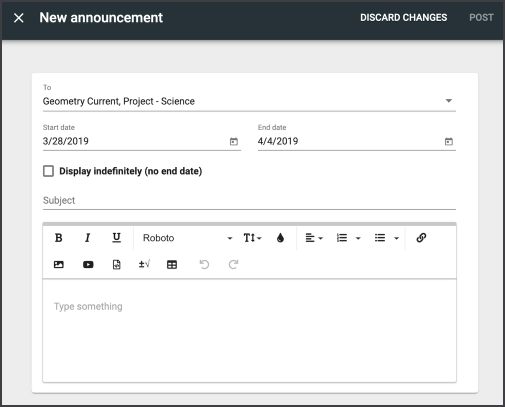 Specify your announcement's start and end dates; the announcement will disappear from the Announcements list on Home once the end date is reached unless you check the Display indefinitely box. Compose your message and click Post. We have occasion to make course announcements from domain administrator accounts in Brainhoney. In Buzz, we don't see the option to make a course announcement unless the user is enrolled as the teacher. Is there a way to make course announcements without having an enrollment in Buzz? In Buzz it is intended for admins to create Domain Announcements and for instructors to create course announcements. There is not currently support for an admin to create a course announcement unless they have an enrollment in the course and performing the action as an instructor. Is there a way to make Announcements mandatory to be read by the recipients once they are logged into the UI? This would be needed in both BrainHoney and Buzz. At this time there is not an option to force announcements to be read by the recipient. We'll flag this for inclusion in discussions for possible enhancements to the system. What does the "communication" icon on the main menu look like? I read above that an admin needs to be enrolled in the course to send a course level announcement, so I logged in as a teacher and don't see an icon labeled "communication". Within the new Buzz UI after signing into the teacher app, the teacher may navigate to the hamburger icon (upper left on the page) which will display options to choose from. Select Communication from the list of choices. Then, the browser will navigate to the Communication page where there is a toolbar at the upper right of the page. Select the Announcement dialogue box icon next to the arrow Send Mail icon. Is there a way to see past announcements? So if we put a start and end date it looks like they disappear. Sometimes it is nice to be able to see past announcements and copy/paste and tweak them slightly to use again? It seems to me we could see announcements that had expired in the past. Thanks for your help? Student's will not be able to see expired announcements, however the teacher may view the expired announcement from the Teacher app by selecting a specific course from the list within the Communication page that the expired announcement applies to. Thank you Brian for highlighting the key was to filter by course. Since I had posted it to all courses I missed that sorting would get those expired announcements to appear.